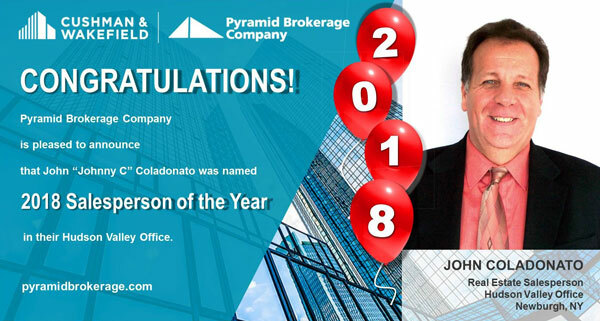 For the second year in a row, John “Johnny C” Coladonato received the Salesperson of the Year Award in Pyramid’s Hudson Valley office. Throughout 2018, John brokered and was involved in multiple transactions, both sales and leases. Amongst these were several notable closings including the sale of the 163,000 SF former Frontier Insurance Company building In Rock Hill, NY to the Center for Discovery, and the sale of 15 Governor Drive in Newburgh, NY, a 60,000 SF office/industrial building located at Stewart Airport field. Coladonato has been with Cushman & Wakefield | Pyramid Hudson Valley since 2009. We congratulate Johnny C on his contributions to the company and well-deserved success in 2018. The 100,000 ± SF industrial warehouse located at 25 Riverside Read More.. The Genesee Plaza, located at 1001 West Genesee Street, Syracuse, Read More..